Over 2400 Pages! 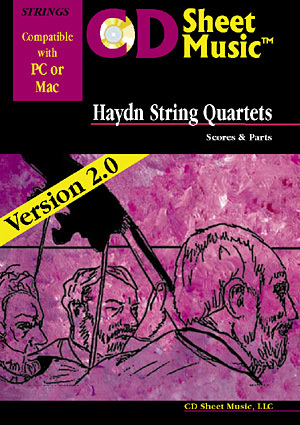 This disk contains the world's most complete collection of Haydn's influential string quartets. Includes the parts to all 87 string quartets and The Seven Last Words of Christ and the study scores of 58 of the most famous quartets. Version 2.0 adds articles on Haydn, String Quartet and related articles from the 1911 edition of Grove's Dictionary of Music and Musicians.